This Christmas was different than those that have come before it. Some of the details aren't important, since I am sure everyone is familiar with the economic impacts going on. This Christmas marked a change in us, a change I would like to both tell you about, and adopt for the future. It's odd how new tradition comes to be. This year our plans were based around spending Christmas with my mother. It's been years since we have all had the holidays together, mainly due to distance. My parents moved out of state shortly after John and I got married, and before the birth of our children. Then, my job took us across the country. far far away. It's only been since July, when we made the decision to move back here to Bend, that we had an opportunity to decide to spend time with family. Normally, packages flow through the mail for weeks beforehand. This is also the first time since my dad passed away, that we have been together like this. And, since God has been doing a restoration of relationships since that day, it seemed aa perfect finale to the season. Until the snow started falling the week beforehand. And falling, and falling, and falling. We became snowbound in our own home, and roads throughout the Northwest were closed to travel. Just in time for the holidays thankyouverymuch. We sat around the house, upset that all our Christmas plans were on hold. It forced us to take stock of what we did have. A tree, some decorations .... and that was about it. Once the city finally remembered our street, and we were plowed John took the initiative to get out and dig up the driveway. A final emergency run to Costco and WalMart ensued. We had no money to give the kids, so a mall budget of $30.00 was allotted each of them. That had to buy gifts for their siblings and if they so chose, parents. We covered a small dinner. For a couple of days, little gifts appeared under the tree and in stockings. There was whispering and deals cut behind the scenes. Christmas morning came, and the traditional Cinnamon rolls appeared. As gifts were opened, there was excitement in the air. Instead of a load of big, expensive presents there were small things. Well thought out things. Sample bottles of a favorite cologne or new bath lotion to try. Complete with a loofah. A favorite CD, a new Tracfone. Sample sizes of mani/pedi supplies and facial ingredients. Gifts were exchanged that truly went to the heart of what the receiver needed, or wanted. That morning, there was no excess. No gifts that would be cast aside and forgotten about. Each gift was praised, the giver thanked profusely. The frenzy of gift opening was replaced with a relaxed and joyful time. Honestly I think it took us longer to open gifts this year than in years before. (We did have the chance to finally get over the mountains and see my mom this past week, and a fun time was had by all). But, I will remember the simple lessons of this restful Christmas. And the lessons we learned about giving to each other thoughfully, and receiving with full attention and gratitude. What Does 2009 Mean to You? What: I would like you to post on your site about your hopes, dreams, and goals for the next year. What would you like to see God do in your life? How would you like to see Him move in things? Make this as general or as personal as you feel comfortable. What are your goals for next year? I am not looking for the “lose 10 lbs this year” answer, something a little bit deeper. When you look back to December 2009 where would you like to be? When: Come back the first week of January 2009 (January 1 through 5th). Where: She will put up a Mr. Linky beginning January 1st through 7th 2009 (at Laurel Wreath's Reflections), so you can link back to your blog post (not just your blog). 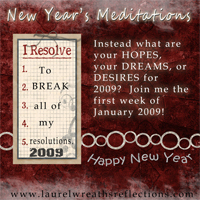 I am not really one to make “New Year Resolutions” (in fact I dislike them), if I make them I break them. But I am one to think about what my dreams and desires are at the time, and see where the Lord leads me. Sometimes it is exciting because the Lord has so much more in mind, sometimes it proves to be a difficult year because He had a lot to teach me. Either way it is exciting to follow God’s leading and plan for my life. How about you? Feel fee to grab the graphic and include it on your blog.I’m looking forward to seeing who will take me up on this challenge! Honestly, I've never been a New Year's Resolutions person, but with everything that has happened in the last three years, I see myself wanting certain things long-term. John and Kati tried to run out for some last minute important items (like ice cream for the utterly delicious Ghirardhelli brownies I just made) and couldn't get half way up the driveway. Or back to the house. "These pictures are for your blog." I fainted dead away, people. I tell ya! But, what a perfect time, don't you think? My Christmas Wish for You and I. Join Me. Please. I wanted to throw up (well, maybe that's a bad choice of words), I wanted to clarify something I said in an earlier post. There have been several (over 20) people who have lovingly been tested be a living kidney donor at Denver Porter Adventist. And we are eternally grateful to you and you families. If you were tested, or wish to be tested at Denver, but would also like to be considered for transplant at Portland (Oregon) you are welcome to. You would need to go through each process separately, as they each have their own protocols. If you have been tested and turned down in Denver, you may still be a candidate in Portland. Denver is (for all intents and purposes) a direct donor to recipient transplant center. In other words, you have to be a match. Period. Portland has what is called "High PRA" protocol. They look for someone who would be the best match for me, knowing that right now we are "not" a match. Once that person is located (and it could be someone that Denver said 'no' to), I will be put though a month long process of injections called IVIG which is supposed to make me receptive to whomever they find for me. It basically re-writes my antibodies to go from "reject" mode to "accept" mode. I am filing them all away until we get committee approval at Portland, and they are ready to start testing. I will then contact you with the info at Portland and if still interested, you can contact them directly. If I have confused things even more, jut email me with your questions- or ask them below- and I will answer them as best I can. All I want for Christmas is a new kidney. Welcome to the Great Northwest. Holy Christmas Moly, we have snow. White, white everywhere and not a road to drive. Funny thing is, Kati was complaining quite loudly and longly that she wanted snow for her birthday this year. And John's response was something akin to challenging God, fist-in-his-face-holy-double-dog-dare-you comment of "Oh, its too late for it to start now. I don't think we will get any snow this year." Today? We had to GET. OUT. OF. HERE. Now, we had the essentials. John and Kati had dug out the driveway and 4x4'd it t to our little village for toilet paper and cherry coke yesterday. But, we had Christmas shipping to finish. And since everything had originally been sent to my mom's for Christmas, and there was no earthly way we were getting through the pass for Christmas, we had nothing here. We had a fake tree and empty stockings. Sort of like Who-ville, post-Grinch. So, with a break in the snow we beat feet outta here to Walmart and Safeway to secure our goods. As did everyone else. Oh my word. The crowds. You should be home, Where it's warm. Not operating vehicles that can kill. We actually saw one jacked up pickup that had backed up over the top of another pickup truck. I have NO idea how it happened, but the end result was rather a wonder to behold. And, I'm proud to say that of the multiple accidents we saw, we were only observers and not participants- ThankGodFromWhomAllInsuranceRates (With Two teen Drivers Coming Up) Flow. The trip home was a wonder. The snow started in Bend, pretty heavily, but as we headed south for the 20 miles ride home it seemed to lighten up. And of course, about this time John does that thing again and says" Looks like it's hittimg here but not at home. We're getting pretty lucky". More snow that you can imagine. We crawled home by following the snow berms on the cliff side of the road. Ugh. It was by far the most enjoyable thing I've done in a long time. We made it safe and sound. We have food, some little trinkets to put under the tree and enough toilet paper and cherry Coke to take us through another two weeks or so of snow. Which is good, since we see no relief on those 15 day forecast maps. And who knows,. maybe I'mm be as thin as Shelly Devall by the time this is all over. January 7th is the day we *hope* to get over the pass to Legacy Emmanuel Portland for our intake interview for their Kidney Transplant Program . Although I've been listed with Denver Porter Transplant for almost two years, two very long and emotional years, the chances of me getting a match there is difficult. We have tested many living donors only to hear "no" over and over and over again. Portland has a different protocol for folks like me. If we can find a suitable donor (living) them I go on a month long series of treatments to lower my rejection rates. It's difficult and expensive, but in the end if it works- well, well worth it. As we get closer, I get more nervous. I worry about each step of the process. It's who I am, it's what I do. The holidays have brought about a renewal in my heart to fight, to be here for the longest period of time I can and to make the most of it. Would you join with me and pray that my hear would be at peace, that I could continue to .let go of what I can't control and to accept what comes? That would be the greatest gift I could receive this year. With everything that has been going on around here the last few months, I've really struggled with the holiday this year. Normally, I'm all over the Christmas shopping. baking and decorating, but this year it's all escaped me. Like a long lost love. back in the dredges of my heart, trying to pull forward. Like a child again, I want to believe in Christmas and all that it promises. A few nights ago Kati, Jonathan and John were hard at work decorating the tree. We stumbled on a box that contained an old video camera, as well as some tapes from things past. John dug out a battery for the camera and we were surprised to find one of the tapes was from Christmas past. Plans for the evening came to a halt as we gathered around the TV to watch the old home movies. Laughing, teasing and lots of "remember when" rang throughout the room as the next few hours flew by. I sat in awe watching how much things had changed and how much they stayed the same. More honestly, though I became lost in thought as to "What if this were my last Christmas here",. How would things change, how important would these tares become in remembering for them. Would they, in time, remember me or would I become like a faint memory as time progressed. Loved, but a memory. Would they remember what I looked like, the sound of my voice. In that moment, I became determined to be present for these holidays. Force myself if need be, to focus on today, this moment and not the "what ifs". There will be a time and place for that. I am trying to accept that there are things that cannot change, that will be slow to change. That it's not in y control, on my time line, off my list. And that is a really hard thing to accept. I'm ever reminded that this journey is very cyclical, ever changing, expanding and narrowing my focus as need be, based on where we are in the road and what presents itself to be dealt with. But tonight, it's about my kids.Their memories of the holiday, and of me. Of us as a family. I would prefer that in days ahead they look at me as strong, capable, determined and perfect. Able to ride this thing out with the greatest of ease. What they will see is I'm human- weak, strong, indecisive, scared, unstoppable, gritty, fearful. But, I hope what they do see in me is that I never gave up on wanting to love them, or be here for them. If I can just do that, I think the rest will just fade like so much fog and mist as memories live on. I started this thing called a blog 2 years and a bit ago, with the sole purpose of keeping friends and family aware of lab results. I'm not one to pick up the phone and want to call everyone with these types of things, and I thought this would be an easy out a way to keep everyone posted and satisfied. In the beginning, I added Sitemeter to my blog just to see how many times people actually came over to see these things. As most newbies to the blawg-ey world, I lived on my stats.... you know, happy when up, sad when down. You've done it. Come on. Admit it. I never thought I would have over 100,000 hits on this little thing. I never imagined the blessings that would come from starting this thing. I never imagined the friends I would make when I started this thing. I never imagined ow my life would change because I started this thing. And so the point of this? Thank you from the tippy toes of my heart. So, it's been abit quiet around the blawg the last week or so. We've been busy, and I've been trying to keep my head just above the waterline. We have had Thanksgiving, birthdays, Christmas prep- like you and your families, I'm sure. It's run. run. run. Add in a few Dr. appt's and a 7 hour transfusion? Thanksgiving was a hoot. We drove to Springfield, alittle over 3 hours away, to have lunch with my mom and a friend of hers. There was alot of laughter, and great conversation and well worth the 7 hours of driving that John (and not I) had to do in that one day. BTW, to keep from falling asleep John gave my his turkey and took my jam. Rather smart that man. Then, the boxes came out and the decorations started to go up! The fakey-fake tree went in the window all lit up and purdy .... and lights, garland and good cheer abound everywhere! Following on the heels of that trip, we had to prepare for Kati's Sweet 16. We went shopping and found the prettiest ring for her. John and I wanted to give her something as an heirloom to hold on to forever to remember this day. And a sweet pear shaped in her birthstone, flanked by delicate stones was just the ticket! Jonathan got her some socks she has been begging for. Socks. Happy Sweet 16 .... yes, odd we are but oh so lovable! She wanted to make her own cake, but we talked her into a store bought cake. It was beautiful, but oh. so. nasty. tasting. That girl came bake a mean cake- so next time? I'll shut up and let her bake away! The kids have been bugging us to go ice skating, so John took them Saturday night for the last session. Jonathan now wants to play ice hockey, while Kati has decided that Michelle Kwan has no competition in in her. Thankyouverymuch. Everyone came down with horrendous colds and have been home from school ever since. And with that, I give you our life in pictures. Purdy Cake on the outside ... deadly on the inside ... but what a purdy girl!